A new Japanese religion based largely on Shinto. 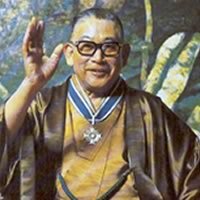 One of the group’s official sites states that "Sukyo Mahikari has its roots in an organization that Mr. Kotama Okada founded on August 28, 1959, to promote Mahikari practice. This was in response to a revelation he received from Creator God on February 27, 1959." Mahikari is descended from the Church of World Messianity (Sekai Kyusei Kyo), with which it shares many similarities. Two main factions struggled for leadership following the founder’s death 1974; in 1982 the parties resolved to maintain separate organizations (Sukyo Mahikari and Sekai Mahikari Bunmei Kyodan). Outside of Japan, the movement has found its largest following in Latin America. One official web site claims that "There are Sukyo Mahikari centers in more than 75 countries."